How to copy Blu-ray movies to MP4 for Asus Fonepad 7 tablet? Tablet PCs, smartphones and other portable devices have made our on-the-go life rich and colorful. The new and improved 7-inch Android tablet Asus Fonepad 7 is such a device amongst them. The Fonepad 7 has combined the best of the smartphone experience with powerful tablet ability that will improve every aspect of your life, according to Asus. The 7-inch display has a crisp 1280 x 800 resolution with IPS (In-Plane Switching) technology for wide viewing angles and excellent daylight visibility, while dual-front SonicMaster speakers deliver high quality audio to bring entertainment to life. The Asus Fonepad 7 is designed for your on-the-go life, and you can take it with you wherever you go. In such a case, you may consider digitalizing some of your Blu-ray movies and put them onto Fonepad 7 for personal entertainment when on holiday or on business trips. The purpose of this article is to introduce how to backup Blu-ray to Asus Fonepad 7 using Pavtube Blu-ray Ripper. Why choose Pavtube Blu-ray Ripper? Because it is easy to use and offers the ability to rip Blu-rays to specific profiles for the mobile devices that you own, such as Asus Fonepad, Samsung Galaxy Tab 3, Apple iPad, iPad mini, Google Kindle Fire HD, and more. Apart from that, it ensures audio and video in sync with good results, and this is an important consideration point. A free trial version (download Blu-ray Ripper free trial) is provided for you to see if it would be able to convert your Blu-ray movies to a format that is well compatible with your device. The trial version features the same functionalities as the full version, but creates videos with PAVTUBE logo standing in the center of the output image. To get rid of the watermark, you need to buy its full version. The guide below displays the detailed steps on how to copy Blu-ray to MP4 for Asus Fonepad 7 using Pavtube Blu-ray Ripper. 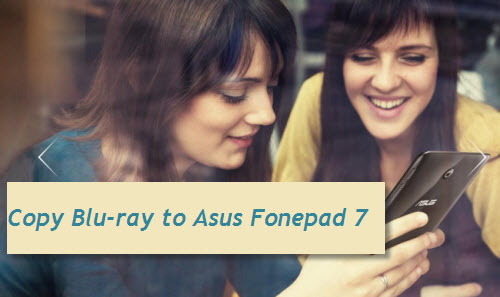 How to copy Blu-ray movies to MP4 for Asus Fonepad7 tablet? 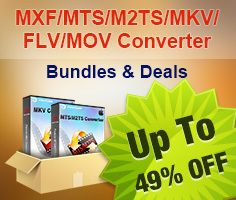 Start up Pavtube Blu-ray Ripper as a professional Blu-ray to Fonepad 7 Converter. Click “Load file(s)” button to load Blu-ray files directly from your Blu-ray disc, this requires an internal or external Blu-ray drive. You can also load a Blu-ray ISO image file or a Blu-ray folder that stored on your computer’s hard disk drive. If necessary, you can select a wanted subtitles stream or a audio track to be preserved in the output file. Then while viewing Blu-ray rips on your device, there will be subtitles displaying on the screen accompanying with your specified audio channel. Pavtube Blu-ray Ripper comes with optimized format presets for Fonepad 7, this makes it possible for you to easily find out a proper profile for your device. 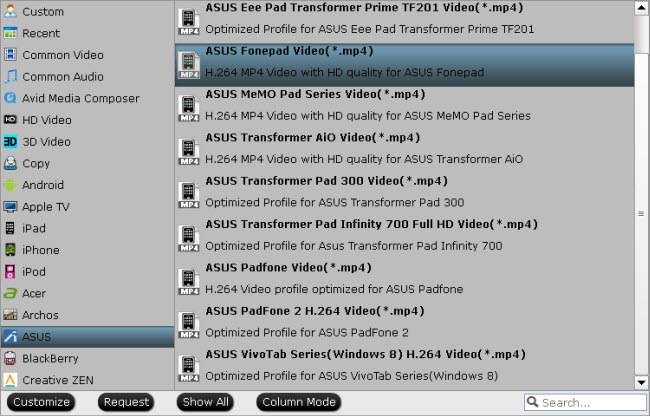 From Format bar, move to “ASUS” column, and choose “ASUS Fonepad Video (*.mp4)” as output for your Fonepad 7. Click “Convert” button to start Blu-ray to Fonepad 7 conversion. If you don’t want to wait in front of the computer for the entire ripping process, you can check “Shut down computer after conversion” option and go away to do other things. The Pavtube program will take care of the rest. 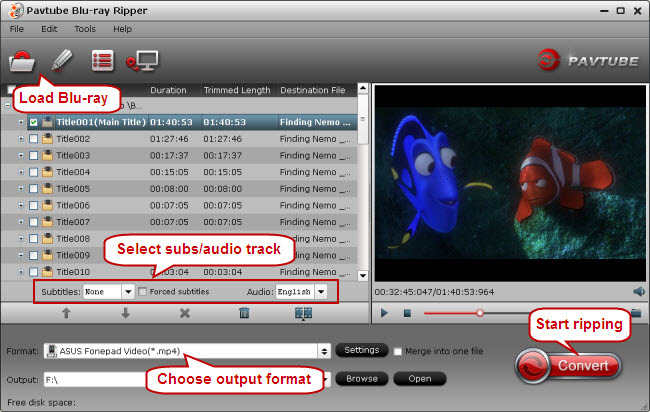 When the ripping task finished, simply click “Open” button to locate the exported MP4 files. How to transfer 2014 Disney movies to VTech InnoTab 3S for your kids? How to stream Blu-ray movies to any device via Plex over home network?